This article is about the city in Sweden. 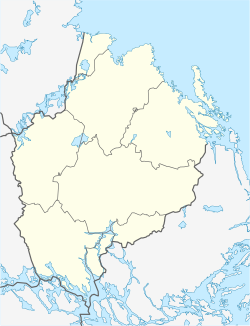 For the municipality (Uppsala kommun), see Uppsala Municipality. For other uses, see Uppsala (disambiguation). 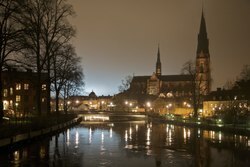 Uppsala Cathedral in the background of the Fyris River. Uppsala (/ˈʊpsɑːlə, ˈʌp-/, also US: /-sələ, ˈuːpsɑːlə, ʊpˈsɑːlə/ or all ending in /-sɑːlɑː/, Swedish: [²ɵpːˌsɑːla] ( listen); archaically spelled Upsala) is the capital of Uppsala County and the fourth-largest city in Sweden, after Stockholm, Gothenburg, and Malmö. It had 168,096 inhabitants in 2017. 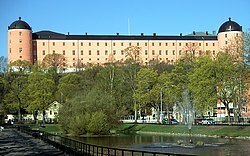 Located 71 km (44 mi) north of the capital Stockholm it is also the seat of Uppsala Municipality. Since 1164, Uppsala has been the ecclesiastical centre of Sweden, being the seat of the Archbishop of the Church of Sweden. Uppsala is home to Scandinavia's largest cathedral – Uppsala Cathedral. Founded in 1477, Uppsala University is the oldest centre of higher education in Scandinavia. Among many achievements, the Celsius scale for temperature was invented there. Uppsala was originally located a few kilometres north of its current location at a place now known as Gamla Uppsala (Old Uppsala). Today's Uppsala was then called Östra Aros (Eastern Aros, to differentiate it from Western Aros). (Old) Uppsala was, according to medieval writer Adam of Bremen, the main pagan centre of Sweden, and the Temple at Uppsala contained magnificent idols of the Norse gods. The Fyrisvellir plains along the river south of Old Uppsala, in the area where the modern city is situated today, was the site of the Battle of Fyrisvellir in the 980s. The present-day Uppsala was at that time known as Östra Aros and was a port town of Gamla Uppsala. In 1160, King Eric Jedvardsson was attacked and killed outside the church of Östra Aros, and later became venerated as a saint in the Catholic Church. In 1274, Östra Aros overtook Gamla Uppsala as the main regional centre, and when the cathedral of Gamla Uppsala burnt down, the archbishopric and the relics of Saint Eric were moved to Östra Aros, where the present-day Uppsala Cathedral was erected; it was inaugurated in 1435. The cathedral is built in the Gothic style and is one of the largest in northern Europe, with towers reaching 118.70 metres (389.4 ft). 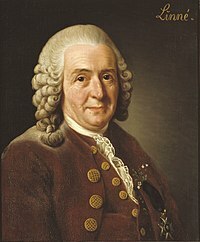 The city is the site of the oldest university in Scandinavia, founded in 1477, and is where Carl Linnaeus, one of the renowned scholars of Uppsala University, lived for many years; both his house and garden can still be visited. Uppsala is also the site of the 16th-century Uppsala Castle. The city was severely damaged by a fire in 1702. Historical and cultural treasures were also lost, as in many Swedish cities, from demolitions during the 1960s and 1970s, but many historic buildings remain, especially in the western part of the city. The arms bearing the lion can be traced to 1737 and have been modernised several times, most recently in 1986. The meaning of the lion is uncertain, but is likely connected to the royal lion, also depicted on the Coat of Arms of Sweden. Situated on the fertile Uppsala flatlands of muddy soil, the city features the small Fyris River (Fyrisån) flowing through the landscape surrounded by lush vegetation. Parallel to the river runs the glacial ridge of Uppsalaåsen at an elevation around 30 m (98 ft), the site of Uppsala's castle, from which large parts of the town can be seen. The central park Stadsskogen (literally "City Forest") stretches from the south far into town, with opportunities for recreation for many residential areas within walking distance. The commercial centre of Uppsala is quite compact. The city has a distinct town and gown divide with clergy, royalty, and academia historically residing in the Fjärdingen neighbourhood on the river's western shore, somewhat separated from the rest of the city, and the ensemble of cathedral, castle and university buildings has remained mostly undisturbed until today. While some historic buildings remain on the periphery of the central core, retail commercial activity is geographically focused on a small number of blocks around the pedestrianized streets and main square on the eastern side of the river, an area that was subject to a large-scale metamorphosis during the economically booming years in the 1960s in particular. During recent decades, a significant part of retail commercial activity has shifted to shopping malls and stores situated in the outskirts of the city. Meanwhile, the built-up areas have expanded greatly, and some suburbanization has taken place. Uppsala lies immediately south of the 60th parallel north and has a humid continental climate, with cold winters and warm summers. Due to its northerly location, Uppsala experiences over 18 hours of visible sunshine during the summer solstice, and under 6 hours of sunshine during the winter solstice. Despite Uppsala's northerly location, the winter is not as cold as other cities at similar latitudes, mainly due to the Gulf Stream. For example, in January Uppsala has a daily mean of −2.7 °C (27.1 °F). In Canada, at the same latitude, Fort Smith experiences a daily mean of −22.4 °C (−8.3 °F). With respect to record temperatures, the difference between the highest and lowest is relatively large. Uppsala’s highest recorded temperature was 37.4 °C (99.3 °F), recorded in July 1933. On the same day Ultuna, which lies a few kilometres south of the centre of Uppsala, recorded a temperature of 38 °C (100.4 °F). This is the highest temperature ever recorded in the Scandinavian Peninsula, although the same temperature was recorded in Målilla, Sweden, 14 years later. Uppsala’s lowest temperature was recorded in January 1875, when the temperature dropped to −39.5 °C (−39.1 °F). The second-lowest temperature recorded is −33.1 °C (−27.6 °F), which makes the record one of the hardest to beat, due to the fact that temperatures in Uppsala nowadays rarely goes below −30 °C (−22 °F). The difference between the two records is 76.9 °C (138.4 °F). The warmest month ever recorded is July 1914, with a daily mean of 21.4 °C (70.5 °F). Since 2002 Uppsala has experienced 5 months where the daily mean was 20 °C (68 °F) or warmer, the most recent in July 2014 when the daily mean was 20.5 °C (68.9 °F). The coldest month ever recorded is January 1814, when the daily mean was −14.9 °C (5.2 °F). Between January 1814 and January 1987, Uppsala experienced 23 months that were colder than −10 °C (14 °F). Since February 1987, the coldest month recorded is −8.6 °C (16.5 °F). The warmest year ever recorded was 2014, with an average temperature of 8.1 °C (46.6 °F). The second warmest is 2011, with 7.8 °C (46 °F). Since 1991, Uppsala has recorded 14 years with an average temperature of 7 °C (44.6 °F) or warmer. The coldest year ever recorded was 1867, with an average temperature of 2.5 °C (36.5 °F). 1987 was the last year Uppsala recorded a year with an average temperature below 5 °C (41 °F). The climate table below presents weather data from 1981–2010. According to ongoing measurements, the temperature has increased during 1981–2010 as compared with the 1951–1980 series. This increase is on an annual basis around 0.9 °C. Warming is most pronounced during the winter and spring. January, February, and March have had the most pronouncing increase in temperature, with each month increasing 1.5 °C or more. The only month that did not get warmer is June, which got 0.3 °C colder. During the 20th century, Uppsala has warmed drastically, especially the winter. If compared to the period 1861–1890, the annual increase in temperature is 1.8 °C. March is the month with the biggest increase, where the temperature has increased more than 3 °C since the latter parts of the 19th century. Winter normally arrives in late November, and lasts until the middle of March when spring arrives. Summer usually arrives in the middle of May, and lasts until late September when autumn arrives. Precipitation is most common between June and November, in all these months it falls 50 mm (2.0 in) or more on average. August receives most precipitation with 74 mm (2.9 in). Between January and May precipitation levels fall a bit, with all months receiving less than 40 mm (1.6 in) on average. Annual precipitation is 576 mm (22.6 in). Rainfall can occur all year round, although it is less common in January and February. Snowfall mainly occurs between November and March. Snowfall in October and April can happen from time to time, but not every year. During the night between 30 April and 1 May 2014 it fell approximately 15 cm (5.9 in) of snow in Uppsala, the first recorded snowfall in May since 1981. Today Uppsala is well established in medical research and recognised for its leading position in biotechnology. In its 2017 report, Police in Sweden placed the Gottsunda district in the most severe category of urban areas with high crime rates. Regional chief of police Carin Götblad stated that the classification was due to having a number of criminal gangs, many illegal weapons in circulation and families where a criminal lifestyle is inherited from generation to generation. In 2019, a poll by the council found that four out of five girls in Uppsala felt unsafe walking alone outside due to harassment by gangs of males. This represented a doubling since five years earlier. Uppsala University. Founded in 1477, under bishop Jakob Ulvsson. Closed in 1515. Officially reopened in 1595, following the Uppsala Synod in 1593. The university has a famous anatomical theatre, constructed by the scientist and polymath Olof Rudbeck (1630–1702), in the old university building Gustavianum. The building is now a museum. The university has 13 student fraternities, known as "nations", each traditionally representing a geographical region of Sweden. Swedish University of Agricultural Sciences (SLU, Sveriges Lantbruksuniversitet, main campus). Johannelunds Teologiska Högskola. A Lutheran theological seminary established in 1862, located in Uppsala since 1970. The Newman Institute. A Catholic institution founded in 2001. Pingströrelsens teologiska seminarium. A Pentecostal theological seminary, which does not have accreditation from the Swedish National Agency for Higher Education and cannot confer Swedish academic degrees. The Fyris river (Fyrisån) neatly divides the city into two different parts: the historic quarter to the west of the river and the modern administrative, residential and commercial city centre to the east. Most of the historical sights and university buildings are in the western part, with a medieval street layout, river views and parks and dominated by the cathedral. The most outstanding building in Uppsala is the Domkyrka (Uppsala Cathedral), Scandinavia's largest church building (118.70 m (389.44 ft) high). Together with Uppsala Castle it has dominated Uppsala's skyline since its construction in the 13th century and can be seen from a long distance outside the city, other tall buildings being rare. Facing the west end of the cathedral is the Gustavianum, built in 1625 to be the main building of the University, and served as such through most of the 19th century. It contains the Museum of Nordic Antiquities, the Victoria Museum (of Egyptian antiquities) and the University's cultural history collections. It also houses a perfectly preserved 17th-century anatomical theatre (used in its time for public dissections). Next to Gustavianum is the 18th century Archbishop's Palace, the official residence of the Lutheran Archbishop of Uppsala and the primate of the Church of Sweden. Across the street from the Gustavianum in the University Park stands the University Hall, erected in 1879–86 in Italian renaissance style. The Uppsala University Coin Cabinet is located in the university main building. Not far from the University stands the Uppsala University Library (Carolina Rediviva), the largest library in Sweden, with over 5 million volumes and some 60,000 manuscripts. The building was built in 1820–41. On a circa 35-metre high hill to the southwest of the University Library stands Uppsala Castle. Its construction was initiated in 1549 by King Gustav Vasa, founder of the Vasa royal dynasty. 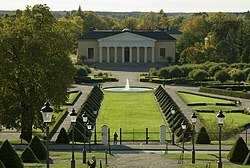 Today the castle holds several museums, among them the regional art museum, and is the residence of the Uppsala County Governor (landshövding). There are several botanical museums in Uppsala related to the world-famous 18th century botanist and zoologist Carl Linnaeus; the Botanic Garden next to the castle, the Linnaean Garden in the city centre, and Linnaeus Hammarby, Linnaeus' summer house in the countryside village of Danmarks Hammarby south of the city. 5 kilometres (3 miles) north of Uppsala city lies Gamla Uppsala (Old Uppsala), the location of the pre-Christian settlement of Uppsala which later provided the new name for the medieval settlement further south. There are few remains, with the exception of several huge burial mounds of pre-Christian monarchs and the previous cathedral from 1164 A.D., traditionally said to be built over the old heathen temple (and recent archaeological investigations seems to support this notion). 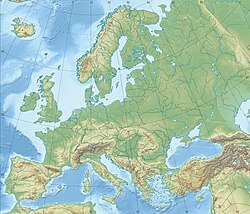 The site was a major religious centre in Scandinavia in pre-Christian times. After the old cathedral church burned down around 1240 it was only partially restored to a more modest size as it no longer was the seat of the Archbishop. The Gamla Uppsala Museum exhibits archeological finds made during excavations in Gamla Uppsala and related finds from other parts of Uppland, as well as exhibitions on the history of the site itself. Trains depart Uppsala Central Station in three directions. There are trains to the south, Arlanda, Stockholm and Linköping, to the northwest, Dalarna, and to the north Gävle, Sundsvall, Östersund and to the northern half of Sweden as well as sleeper trains to Narvik in Norway. While Uppsala has no airport of its own, Arlanda Airport is located about 30 km south of Uppsala. Ärna Airport north of Uppsala is a military airport. The largest arena in Uppsala is Fyrishov and is Sweden's fourth most visited, specialized in swimming, sports events, meetings and recreation. The facility includes areas for indoor sports, summer sport and a generous waterpark with waterslides, 50-meter pool, training pool, relaxation area and a large outdoor swimming pool. Accommodation is offered at the Fyrishov cabin area, and at the resort restaurants a good lunch or dinner can be enjoyed. Fyrishov AB's business also includes the operation of Gottsundabadet in which there is a 25-metre pool, a 10-metre children's pool and gym. The entire facility is open all year round and a large number of meetings and various events are held here annually. In addition to activities within the arena Fyrishov AB runs Tävlingsstaden Uppsala in a collaboration between the sports organizers, Fyrishov AB, Uppsala, Uppsala Tourism and hotel business. Co-founded in 2006 by Fyrishov AB under the name SM-town Uppsala in 2007 but was expanded to include international events and competitions at high national level. The project aims to develop Uppsala, a leading sports town in Sweden. In 2009 there were 24 SM-competitions and major national and international competitions in Uppsala. At Fyrishov the city's basketball team Uppsala Basket also plays, former KFUM Uppsala, their home games in the Swedish basketball league. There are also athletic club Uppsala, Uppsala, fencing club, Uppsala Judo Club, Sweden's oldest judo club, Uppsala volleyball companion, Upsala weightlifting club and Upsala Simsällskap, one of the world's oldest swimmingclubs. The sport that draws the most audience is floorball. Uppsala's two teams in the Swedish Super League, Storvreta IBK and IK Sirius IBK, have Fyrishov as their home. One of the most classical sports events, the Swedish bandy final, took place at Studenternas IP 1991-2012. After being played indoors in Stockholm 2013-2017, from 2018 it is again played in Uppsala. It usually attracts a spectator crowd of more than 20,000. Once every year, the Uppsala Union of Science and Engineering Students arrange a river rafting in the Fyris river with rafts built from styrofoam. Christine Daaé in Gaston Leroux's The Phantom of the Opera was born in Uppsala. The Gösta Knutsson children's book series Pelle Svanslös are set in Uppsala. In Stieg Larsson's novel The Girl With the Dragon Tattoo, Richard, Harald, and Greger Vanger attend university in Uppsala where they form Nazi affiliations. Uppsala is mentioned in German heavy metal band Rebellion's song "Sweden". In the History Channel's Canadian-Irish TV series Vikings, Uppsala is visited by Ragnar Lothbrok and his entourage to worship the Aesir Gods and offer a human sacrifice to appease them. In that visit Lothbrok meets Uppsala's King Horik. The episode was criticised for its poorly researched depiction of Uppsala, which was shown as being located in a mountaineous region, as well as of its heathen temple, which in the series was built in the style of a medieval Christian stave church. In Brad Thor's novel Full Black, Scot Harvath leads a black-ops team in Uppsala to gain intelligence and capture the leader of a terrorist cell. Uppsala is mentioned in Raymond Chandler' s novel Playback. Uppsala is mentioned in Satyajit Ray's short story "Sabuj Manush". Uppsala Municipality – Uppsala "kommun"
^ a b "Statistik om Uppsala kommun 2018" (PDF). Uppsala municipality. p. 5. Retrieved 2 February 2019. ^ "Uppsala". The American Heritage Dictionary of the English Language (5th ed.). Boston: Houghton Mifflin Harcourt. 2014. Retrieved 14 April 2019. 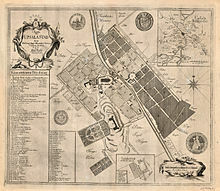 ^ "Uppsala". Collins English Dictionary. HarperCollins. Retrieved 14 April 2019. ^ "Uppsala" (US) and "Uppsala". Oxford Dictionaries. Oxford University Press. Retrieved 14 April 2019. ^ "Uppsala". Merriam-Webster Dictionary. Retrieved 14 April 2019. ^ "Uppsala cathedral – DestinationUppsalaWeb". www.destinationuppsala.se. Retrieved 2016-03-22. ^ P. W. Christensen (1862). "Adam af Bremen om Menigheden i Norden under Erkesædet i Bremen og Hamborg (788–1072)" (in Danish). Karl Schønbergs Forlag. p. 194. Retrieved 15 January 2012. ^ "Uppsala Universitet – Instutitionen för geovetenskaper". ^ Utsatta områden - Social ordning, kriminell struktur och utmaningar för polisen / Dnr HD 44/14A203.023/2016 (PDF). Police in Sweden - Nationella operativa avdelningen - Underrättelseenheten. June 2017. p. 41. Retrieved 22 October 2017. ^ Nyheter, SVT. ""Gottsunda och Valsätra har en problematik"". SVT Nyheter (in Swedish). Retrieved 2017-10-28. ^ Forslund, Julia (2019-03-16). "Många tjejer känner sig otrygga utomhus i Uppsala" (in Swedish). Retrieved 2019-03-19. ^ "Gamla Uppsala – Riksantikvarieämbetet". Raa.se. 15 September 2009. Retrieved 11 October 2009. ^ "Edsbyn Sandviken SM – Final in Upssala". YouTube. Retrieved 9 May 2010. ^ Hesserud-Persson, Stefan (27 April 2019). "Pinsamma missarna i storserien". Upsala Nya Tidning. Retrieved 28 February 2019. Wikivoyage has a travel guide for Uppsala. Wikisource has the text of the Encyclopaedia Britannica (9th ed.) article Upsala.